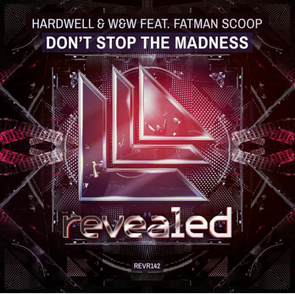 Hardwell recently released the next track from his debut artist album, ‘United We Are’, entitled ‘Don’t Stop The Madness’ with W&W and Fatman Scoop. The track originally premiered at Tomorrowland back in 2013, and now finally gets its release on Revealed Recordings. Joining together as a live force, Fatman Scoop and W&W, unleashed the latest vocal version in-front of a Revealed label night at this year’s Amsterdam Dance Event. Clocking-up live support from Avicii, not to mention across Hardwell’s touring schedule over the past 12 months, ‘Don’t Stop The Madness’ is proving popular for all the artists involved. The track is a big-room production that captures the live feel of Hardwell’s shows, full of energy and looks set to be a biggie on ‘United We Are’.